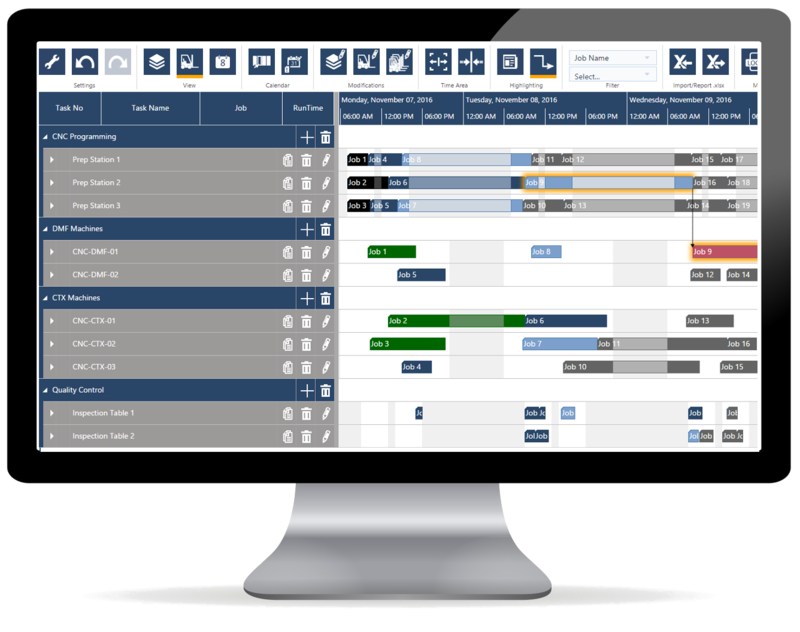 Considering making the switch from a "shirt sleeve approach" to scheduling to a dedicated time and resource scheduling software? Here are ten features that our customers love most. Intuitive drag & drop scheduling. The human is in the driver's seat; not the software. The whole point behind just plan it is the idea of visual scheduling. We do not believe in a sophisticated software that takes over the entire scheduling. Instead, we do believe in software that supports you to master your scheduling challenges. Hence, in just plan it everything starts with intuitive (drag & drop) actions. Priority-based scheduling with clear rules. An easy automatic scheduling supports the user. The empowerment of the user does not stop at a pure manual scheduling. The backbone of just plan it is an (automatic) scheduling engine. This engine is the key to an efficient scheduling. Working with this engine does neither require the mystic and supernatural tricks of a wizard nor a PhD in mathematics like many other advanced scheduling systems. The engine is based on clear rules and stands for a transparent priority based scheduling. You give any job a dedicated priority metric, and we schedule accordingly. Not more, but also not less. Easy editing of jobs, tasks and resources. Straight-forward data editing via clear dialogs. Click on a job and edit it. Click on a task and edit it. Click on a resource and ... you get it: edit it. Everything via clean and focused dialogs. Nothing fancy, but also nothing sophisticates. As pragmatic as you are. 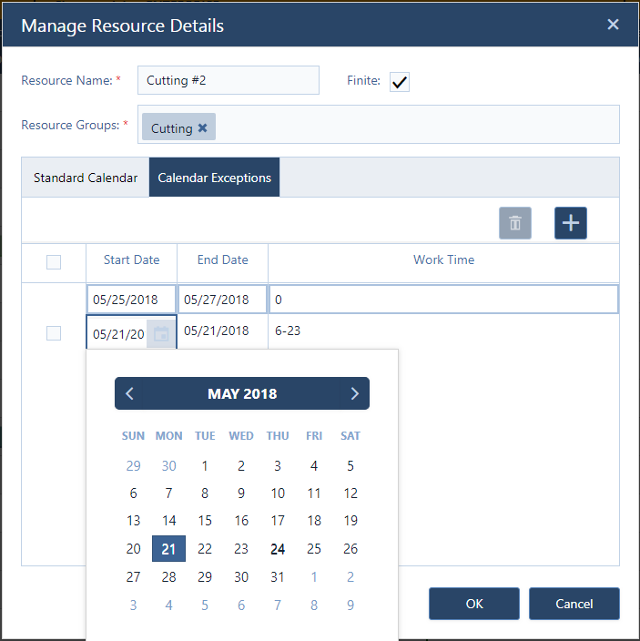 Manage resource calendars and their exceptions. Handle work-times, down-times and unexpected non-work times with few easy clicks. The schedule is flexible when you need it to be. Unexpected machine downtime? Need few resources to work the next three weekends? Run an extra shift for the next four days? Make all of this happen with a few clicks and let the scheduling engine calculate the impact in the blink on an eye. You can hide non-work days, set part-time availability, and even schedule team member holidays and one-off weekend tasks. Easy update of schedule with shopfloor data. Nothing is stable, and hence your execution is not. Get shopfloor changes into your schedule hassle-free. A schedule is only valid in the minute you create it. The execution starts and a lot of things go unplanned. That's for sure. A machine breaks down. The shop personnel decides to work on another task first. It takes longer to finish a task than expected, but sometimes you are faster. Execution is something very dynamic, and hence there is no way to work with a static schedule. 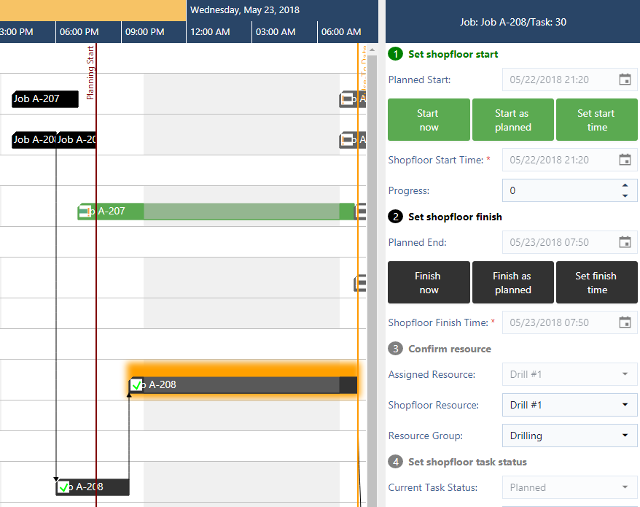 just plan it let's you update your schedule with shopfloor data at your fingertips: easy, understandable and fast. LIKE These Top 5 Features? Think They can help you Better Schedule your shop? Don't Waste time. Start the Free Trial Now. 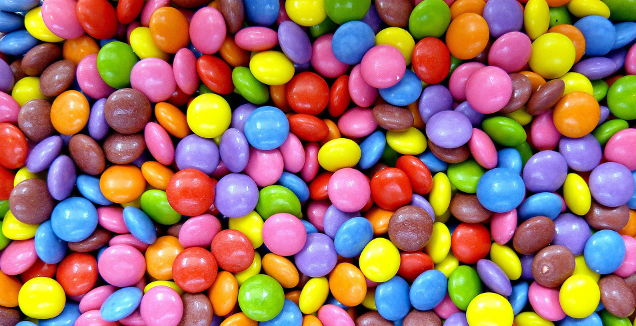 Speaking colors & powerful own color schemes. Keep track of things that matter and take rapid action when needed. A picture is worth a thousand words. just plan it is a visual scheduling software and works with speaking colors. Late jobs and tasks are marked in red and you can easily see them. However, it might be the case that you are concerned more about bottlenecks, or wait times, or jobs for your tier 1 customers, or jobs that consist of a certain material, or, or, or. 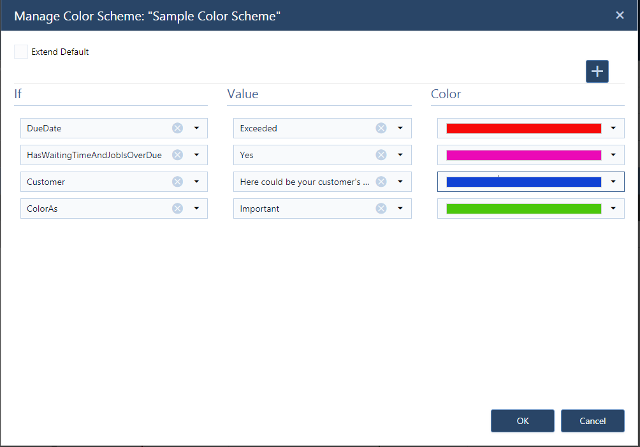 Build your own powerful color schemes with a few clicks and highlight the information that you need when you need. 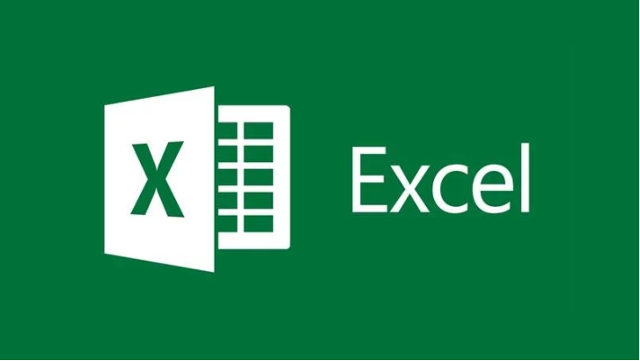 Standard integration with what you know best: Excel. Used Excel for planning so far? No worries: we have a standard interface to this no1 scheduling tool. Have a "planning system" based on Excel? Undoubtedly, this is a great program. But: does it scale with your business? How much effort do you spend on maintaining this sheet? 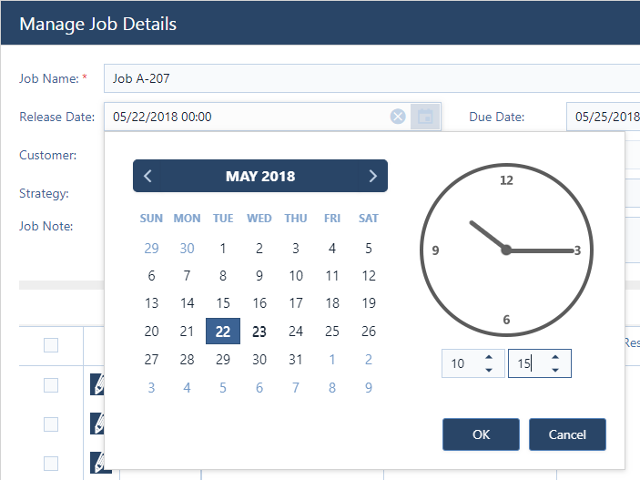 With just plan it you can upload data (jobs, tasks, resources, calendars, etc) from Excel so that you can visually schedule everything within just plan it. It is built to be your next system following Excel. And by the way: if you already use more advanced systems than Excel, we are happy integrating to any other software as well. Powerful reporting on jobs, tasks, and capacities. Not just scheduling, but also reporting - including an on-the-fly export to Excel. Data is the new gold, and there is more than you can do with your data than "just" scheduling. We offer job, task, capacity and more reports that you can export to Excel and further tweak there. We also allow you to build reports that compare actual versus plan. The capacity report tells you a bit about your resource utilization. 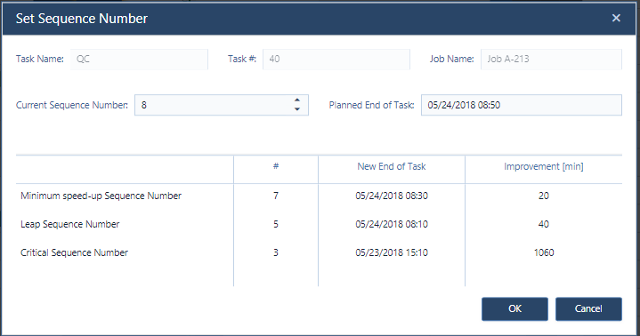 You can report and export tasks lists for your work centers. 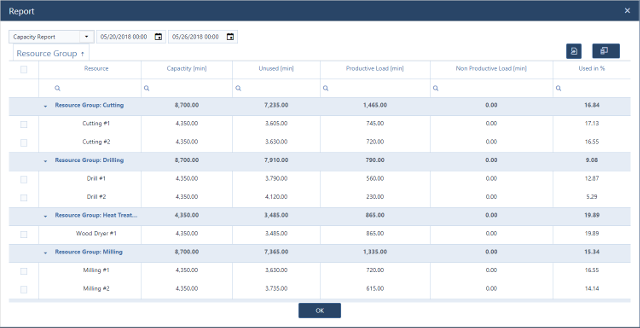 And, of course, you can use these reports to further improve the input data for your future scheduling efforts. Unlimited users: share schedule with your entire team. No kidding: any plan comes with unlimited users. Invite your colleagues at any time. And all have access to a nice and clear visual schedule. This is no general purpose scheduling software. It is made for small make-to-order manufacturers. The good news is: as we are focused on these customers, we are able to standardize our software and hence offer it at favorable price in three different pricing schemes. Ready to schedule your job shop?